SofTap® Permanent Cosmetics is the easiest and gentlest way to implant permanent color into the skin. The SofTap® needle configurations are designed to provide maximum comfort, fast healing, complete control, little or no touchups, and most important of all, the most natural look in the world. How does the SofTap® method work? The needles are gently placed on the skin, scooted slightly forward, and then gently rolled and lifted from the front needle to back needle off of the skin to deposit color. SofTap® needle configurations are designed to provide optimum tension and flexibility, so that you get the most color into the skin with each tap. 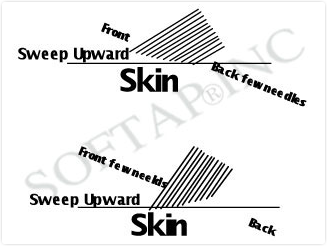 SofTap®'s patented Comfort System needles are tied at the same slope to give you this benefit. Why use the SofTap® method? The first question that your client's friends and family ask them is "Did it hurt?" The most common answers are "It wasn't bad at all", "I fell asleep", "Tweezing hurts more", I'm going back to get everything else done". 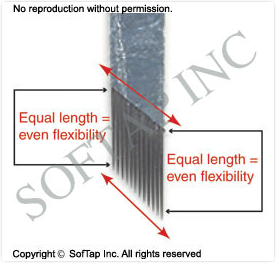 SofTap® provides the maximum amount of comfort for all of your procedures. Even if your most sensitive client becomes slightly uncomfortable, you can quickly put her at ease by simply slowing down your lift off. It is so gentle you have to feel it to believe it. Because SofTap® is so gentle, very little topical is required for your procedures. Brow procedures can be done without any topical at all. This is great because the less topical you have to use, the faster the skin will heal, and the more pigment you will retain. (Topical anesthetic blocks neurotransmitters that signal pain to the affected area, which delays the beginning of the healing process.) 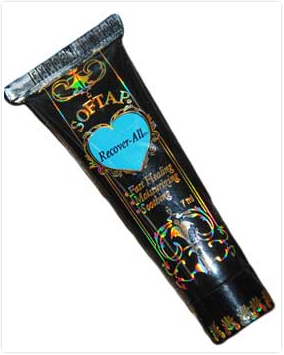 In addition, we strictly use the SofTap® post treatment ointment (Recover-All) to expedite the healing process. It is fabulous! Recover-All traps color into the skin and begins the healing process immediately. Clients love it so much they use it on minor everyday injuries after their procedure has healed! One of the biggest problems that the permanent cosmetic professional faces is that they have to constantly touch up their work. If you are performing the SofTap® technique correctly, you will find that you need little or no touch-ups. The reason for this is because for eyeliner and brow procedures, there is little or no blood. What does this mean? Too much blood washes away any color, and if blood comes to the surface, so will the macrophages of the immune system, which help to engulf any foreign matter that enters the skin. 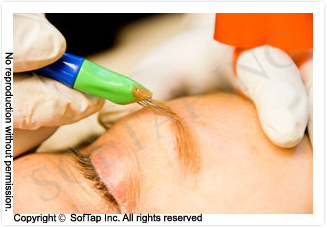 The SofTap® method is gentle enough that you do not have to traumatize the reticular and papillary layers of the dermis and cause bleeding. Instead, pigment is placed at the surface of the skin's dermal layer and allowed to sink lower into the dermis, making the procedure permanent. Because this is a machine-less method, there is no loud noise or vibrating to worry about. You can have complete control over where you apply permanent color with the SofTap® hand method. Color will not be deposited into the skin until you gently roll and lift the needle assembly off of the skin. If you set your needle assembly onto the skin and decide that that's not exactly where you want the color to go down, then no problem! Just take away the needle assembly from the skin and no color will be deposited. SofTap® allows for ease of exact placement of pigment. Eyeliner can be done as thin as this line ___. Because of such precision and control, you can target even the most discriminating clients. The SofTap® hand method provides you with a lot of versatility so that your end results will be completely natural looking. Every angle, every touch of permanent color is at your fingertips with SofTap®. You can choose the most natural colors for your clients and masterfully apply beautiful permanent cosmetics. 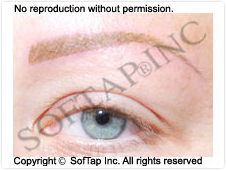 Because our pigments are so natural, and the SofTap® method so gentle, you will never see harsh permanent makeup again. Anyone who has seen results of the SofTap® method agrees that this is truly the most natural look in permanent cosmetics. 1. Gently place your needle assembly on the skin in the place where pigment is desired. Make sure that when you are setting your needles down that all of the needles are touching the skin. 2. Do not depress the skin with the needles. This is can cause unnecessary pain for your client. 3. Scoot the needles forward slightly until you feel them catch into the skin. 4. Gently lift each needle (from front to back) off of the skin, depositing color into the skin where the needles originally made contact. As the needles come off of the skin, the skin should fall off of the needles in sequence (like dominos). Practice this slowly so that you can see this effect. 5. Some tips and tricks. The 12 prong needle configuration is the most popular choice for all procedures because you can work very quickly. Sometimes, however, you will want a shorter line than the 12 prong needle (such as the 3 or 5 prong needle assemblies). You can achieve a shorter line by using a larger needle assembly (such as the 12) and using only the first few or last few needles to tap. Areas where a shorter line may be desired are in the inner portion of the brow and the bow of the lip. 6. If you have one tiny little spot that you need to implant color into or you want to do a beauty mark without having to use an additional 3 prong needle, simply flip the needles upside-down and pick the spot on the skin with the first needle. 1.Silence is not golden. Because this is a non-machine method, there is no loud or buzzing noise. The hand method is extremely quiet except for one small sound. As the needles come off of the skin with each tap, you will hear a sound similar to Velcro being pulled apart. You must hear this sound or else you are not going deep enough. If you do not hear this sound, your pigment will not stay. 2.Stretch that skin. The skin should be pulled tight as a drum when the needles are tapping into the skin. The skin must not move at all when the needles are lifting off of the skin, If the skin is loose, there will be less resistance against the needles which can cause unnecessary pain. 3. Tap quickly and gently. Quicker tapping is much gentler than slower tapping. Tap very fast when filling in larger areas (such as the lips), but do slow down where extreme precision is required. How fast is fast enough? About 3-5 taps in one second. 4. Don't travel around when trying to achieve a solid look. Traveling around means that you are not tapping in the same exact spot. You need to tap in the same spot in order to achieve a solid look such as thin solid lines for the individual lines for the hair strokes on brows, eyeliner, lip liner, and filling in the lips. These areas require tapping in the same spot. If you heard the Velcro sound while working, but your color didn't stay, it means that you did not tap enough times in one area. 5. How many times to tap. This is going to vary from skin type to skin type. Some skin types will accept pigment with only 3 taps in the same spot while other skin types may require much more tapping in the same spot. With practice, your movements will be swift enough that you will be able to tap 3-5 times in one second. With that speed you will sweep through each eyebrow in 10 minutes with a range of 3-12 taps in one spot. Try and remind yourself to stay in one spot longer before moving to a new area. This is the opposite of machine work where the user is told not to stay in one spot. This is very important to keep in mind, especially when doing lips. When filling in the lips with a 28 or a 56 prong needle assembly, you must tap at a pace of 5 taps per second and stay in one spot for about 30-45 seconds before moving to a new area. Do not count how many times you tap, but instead pace yourself by staying in one spot for a certain length of time. By doing this, you will be able to do lips only once or with only one touchup. Make sure that there are absolutely no holidays (no spots of skin showing through) because this will be even more exaggerated when the skin heals. 6. Do travel around for a smudgier, softer look. Tap your needles around randomly when trying to achieve a soft, smudgy look. Do this for filling in between hair strokes on brows, smudgy eyeliner, and texturizing or blending of a lip liner into the lip. 7. Control the darkness of your color by how many times you tap. You will be controlling the darkness of a color by how many times you are tapping into the skin in the same spot. For example, you can have two sets of brows done with the same color and one set is darker than the other. How can this happen? One set was tapped in at 5-6 times in one spot whereas the other set was implanted at 2-3 taps in the same spot. With this in mind, you can vary your darkness and create the most natural looking brows. Tap the least amount of times at the nasal zone or inner tear duct area, the most amount of tapping in the central zone or arch area, and the second most in the outer eye portion (or "tail") of the eyebrow. The end result will be a natural looking brow that is lighter in the bulb/nasal area, darker in the arch area, and a medium darkness toward the end of the eyebrow. For example, for a completely natural look with a medium toned color, you may tap 1-2 times in the same spot in the nasal area, 3-4 times in same spot in the central arch area, and 2-3 taps in the same spot in the tail of the brow. If after healing, your client desires darker color, then just tap in the same color more times in the same spot. You will find that not as many touch-ups are needed if your clients leave your office feeling that they are a little too dark. When they heal, the color intensity should be just right. For solid eyeliner, there should be no holidays (places where implanted color is lighter or missing) at all. If there are holidays present, they will become more obvious when the eyes heal. This is probably the most important aspect to keep in mind when doing eyeliner. I always find myself telling my students that they need to implant more color in the same spot for the eyeliner procedures. Your eyes must scrutinize clients' skin like a hawk and look for any tiny spot of skin showing through. To be on the safe side, when you think that you are done with your eyeliner, go over it again a couple of times more. Of course, for smudgy eyeliner, you would want to have some holidays showing. This would create a softer appearance. You will want to tap into the skin randomly for this. For most procedures, however, you will be filling in your eyeliner solidly. Also make sure that you wipe thoroughly with your moistened q-tips in order to get off any leftover pigment on the skin, because if you do not wipe the area well enough, you will think that the color is implanted into the skin when it just hasn't been wiped off well enough.